Does your dryer vent look like this? If you have never cleaned it chances are it does! 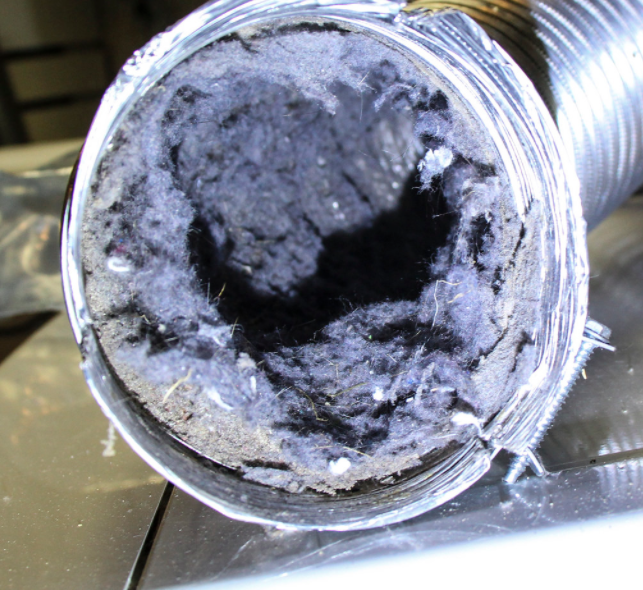 Do you have excessive lint around the dryer vent exhaust on the outside of your home? If so you may be in need of a dryer vent cleaning. According to the U.S. Fire Association 2900 fires are caused by dirty dryer vents every year leading to death, injuries and substantial financial loss. Clothes Take longer than the normal 35-40 minutes to dry. Dryer vent hood flap doesn't open properly while dry vent is running. Lint debris appearing around outside of dryer vent opening. Excessive heat is felt in room where dryer is operating. It has been over a year since your last dryer vent cleaning. Excessive lint and debris is accumulating around your dryers lint trap. Who knew just a small part of your home could be a big hazard if neglected. Lucky for you we offer dryer vent cleaning service. Our trained and qualified air duct technicians are one call away and will gladly come and perform this not so fun task. With great care of your floor and surrounding objects our team will carefully pull your dryer forward from its location. Then the 4" air duct is removed from the back of the dryer. We will perform a visual inspection and can replace this dryer air duct if it has failed per the homeowners request. Next we insert our high CFM air powered cleaning device into the duct and thoroughly clean all the lint from the inside of the duct. If accessible from outside we will clean the exhaust vent and be sure no debris or excessive lint build up is restricting flow of dryer exhaust. If there is lint build up or blockage we remove and clean the vent. Before re installing the dryer vent duct to the back of your dryer, our dryer vent cleaning crew will clean the dryer side of the duct where it attaches to the pipe. Being careful not to tear or pinch the flexible 4" dryer duct, it is then re attached to the back of the dryer after an extensive cleaning. The trained service provider technicians will replace the dryer in to its original location and it will be ready to safely use. Properly cleaning all the lint off your dryers pre filter before each use will prevent having to hire a professional dryer vent cleaning service. Keeping this pre filter clean will allow your dryer to perform at its optimum performance and ensure your clothes are getting dry and your machine and laundry room is safe.